Hi everyone! I've met the board's header at DeviantArt and I decided to give it a try. So I'm here, at the first Madoka-related forum I've ever registered to. We'll see how lively it gets. I'm prepared to read and watch and discuss and pollute everything with never ending rants about my alternate multiverse which just keep expanding like the one outside. I'm from the faraway land of Hungary and there aren't an awful lot of people to discuss PMMM with. I'm a hermit anyway, living outside human settlements. One of my hobbies is writing which mostly means Madoka Magica related fan fiction. 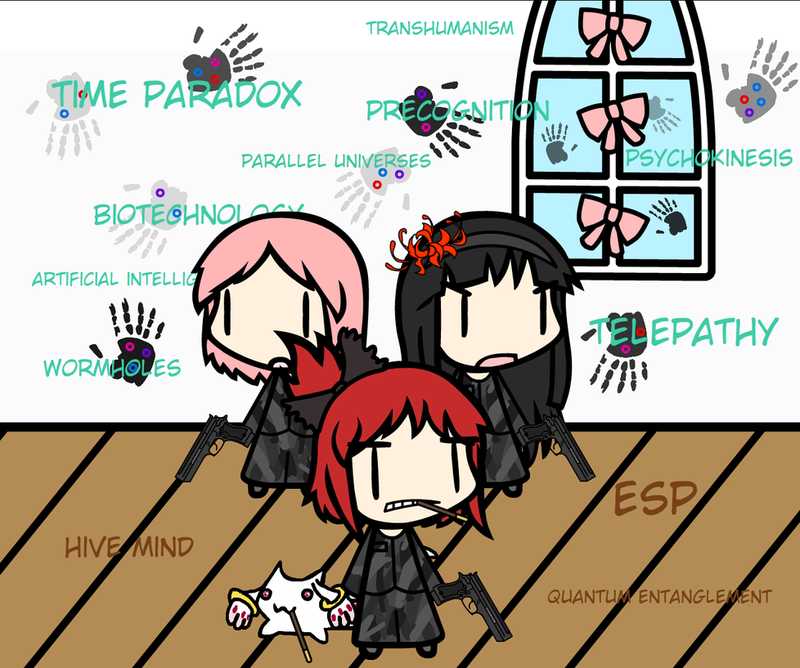 I always bring other elements and worlds in the mix, though my first two stories (Magical Girl Crusade / Girls Of Science Era) are quite 'pure' PMMM/Fringe crossovers. I was amazed how well the two fits. Or maybe it's my brain. It finds connections everywhere. Hi there!!!! Welcome to our forum ^^ It's always lovely to see a new member join our little family ^^ We might not look like too much at the moment, but hopefully we'll get allllll the members =P Yay DeviantArt for helping us get a new one! And we'd love to have you share all your theories and discussions of PMMM ^^ So don't be shy to join in on the threads and to make new ones!! I look forward to seeing you around the forum! Oh, I'm member at a Haibane Renmei forum, imagine how crowded that one can be :D Even the show itself was aired after midnight and while it's a really good one it never got too popular. Madoka Magica has a vast fanbase in comparison. Yeah, Kyouko emoticon, because she's the one who got the taste of this science the best and quickest. I dunno why but I always thought that she's the most intelligent among the five girls, kind of a wild genius. You'll never sit her in a school desk but she'll learn and add two and two together quickly if she's interested - or wants to survive. On the top of fringe science MGC and GOSE teems with cosmological metaphors. Now that I'm writing TRAOD I kind of ditched cosmology and hopped on the paleontology bandwagon - partly for the sake of my Homura's unique familiar which isn't there in Rebellion. Because, unlike her parallel Akuma Homura, she has her earring lizard evolved into something borderline reptilian ;) Just because I had accidentally mentioned "Tatsuya's favorite dinosaur" in GOSE/13. And Homura's subconscious re-created the creature a bit differently, working from her own memories about the Devil and her own Liese birds. I guess. Now I'm looking forward to see more members but it's not a big problem if there isn't that many. I like small homely places. Warning. The stories are long. Hey i remember you! You commented on my Madoka Project journal a couple of months ago on DeviantArt. Welcome to the forum! @Hyper Blossom - Would you be the one behind Elaine Magica? Or another PMMM art project? Or the Touhou crossover game? I tried to track it back but unfortunately failed :( I'll surely look for you @DA just tell me your id or anything to look for! 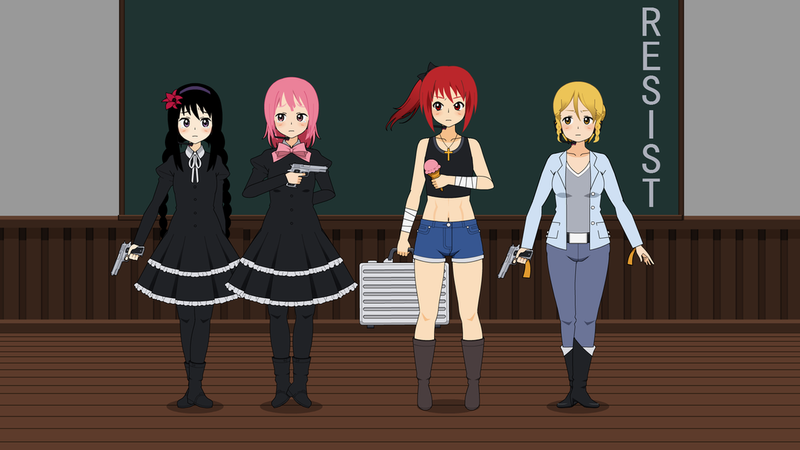 They're more fanfic projects, such as Sera Magica, Miele Magica and Nastya Magica. My username in DA is SailorCerise. I looked you up! Now I'm curious if you have some material posted somewhere.